Kirkman Labs gives you TMG in a hypoallergenic blend for everyone to enjoy. Warnings: Keep the children away. Notes: Also available "With Folic Acid and B-12", "With Folinic Acid and B-12", capsules, powders and liquids. Free of sugar, starch, soy, wheat, casein, gluten, milk, corn, preservatives, yeast, gelatin, flavorings, colorings, peanuts, tree nuts or fish. Recommended Use: 3-6 capsules daily or as directed by a physician. 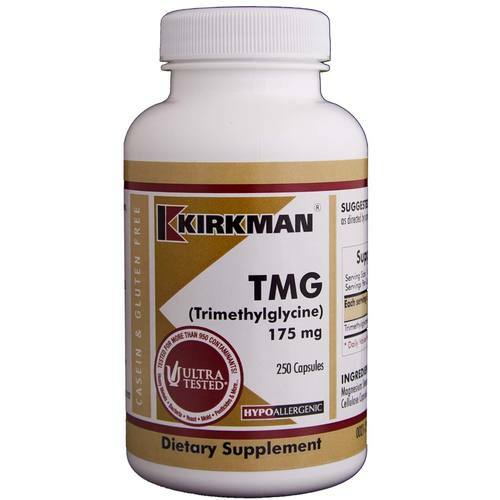 The customer reviews posted below are based on individual consumer experiences and may NOT necessarily represent what expected results will be from using or taking Kirkman Labs TMG (Trimethylglycine) - 250 VCapsules. These results may not be typical and you should not necessarily expect to receive the same results. Actual results may vary.